Sometimes being punctual requires a little help, and the best sort of help is a good alarm clock. Setting an appropriate alarm can mean the difference in keeping your job or not, or in passing or failing a class. Plugin electric clocks avoid the risk of batteries wearing down so that the clock runs slow and the alarm goes off late, with undesirable consequences. Many have a back-up battery to keep the clock from resetting if power is lost. Electric alarm clocks come in a variety of shapes and sizes, with special features to suit them to every circumstance. 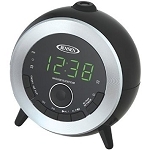 The classic analog alarm clock is still attractive and useful with its big and little hands making their circles around the dial and a third hand to set the time of the alarm, but the more usual choice for today's shopper is a digital alarm clock. These have LED displays so that the time is visible even in the dark, and some have projectors that display the time on the ceiling or a wall. 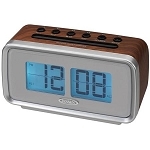 Some electric clocks are in fact clock radios, with AM and FM bands. More advanced models incorporate night lights, chargers for digital devices or interfaces for mp3 players. Telling time is a basic necessity of contemporary life, and being on time requires a good alarm clock. Whether the choice is a retro analog model, a contemporary clock radio or a cutting edge unit with interfaces for phones, mp3 players and even tablets, twenty-first century people need alarm clocks. We try to make the ordering process as painless as possible. Just choose your clock, place your order, and if it reaches us before 2 pm on a weekday, we will normally ship it out the very same day.